From an early age my dad was always insistent I had Raleigh bikes, they were and still are a true national institution for over 125 years with the bikes designed and built in Nottingham England, so when Karen and I were looking at E-bikes for our travels in Europe, it was not a question of which manufacturer only which model! 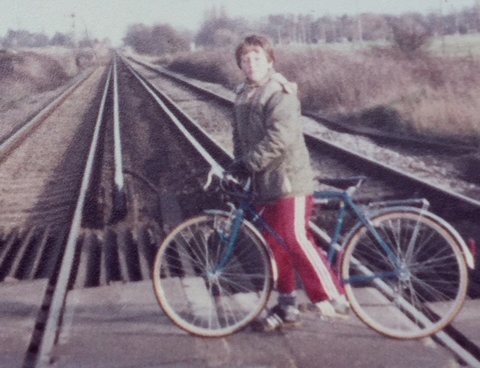 Raleigh UK bikes were the ride of choice all the way through my childhood for myself and most of my mates who grew up on the same estate in Sturry, Kent during the 70s and 80s. 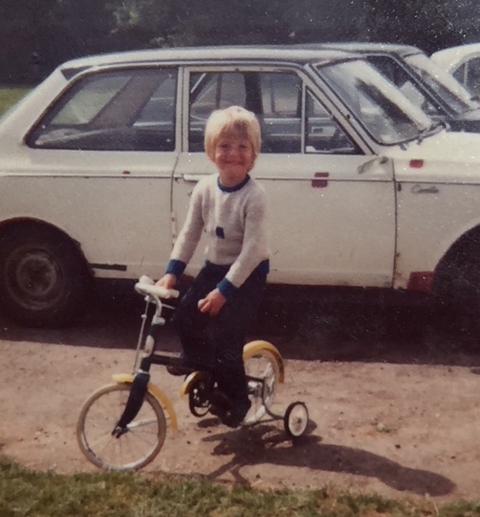 Our bikes provided us with our means of transport and our imaginations provided the rest as long as we were back before dark or when our mums called us in for tea everything was good. My first bike! 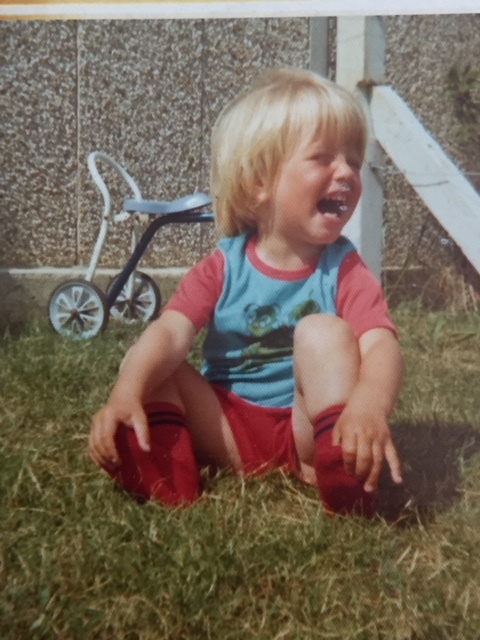 Looking at the paint less handlebars I suspect I wasn’t a bad rider but probably not the first owner of this trike or the shorts and cardigan combo, that’s the way it was back then, that’s my excuse for 70s fashion and hand me downs and I’m sticking with it! 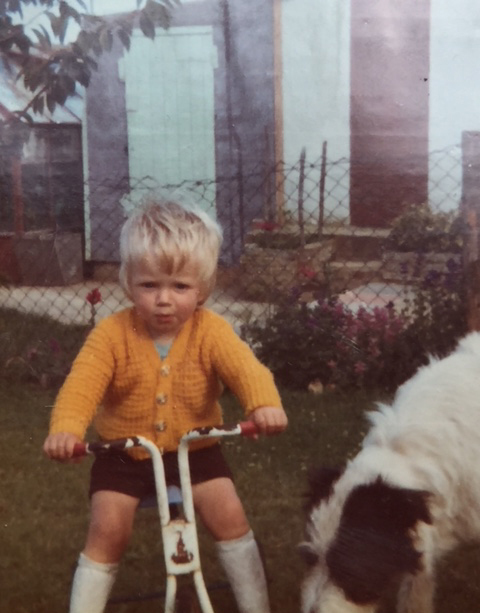 The picture was taken at my Grandads house in Deansway and his dog was called Chopper, I don’t think after the bike, but he did have a wicked sense of humour so leave name choice reasoning up to you! I think I was about 3 in this picture and it would have been around the summer of ’76 at our house in St Nicholas, the house hadn’t long been built and I remember the lawn looked like there had been an earthquake with the cracks during the drought, I could often be found inside one trying to retrieve my toys that invariably ended up getting lost inside. 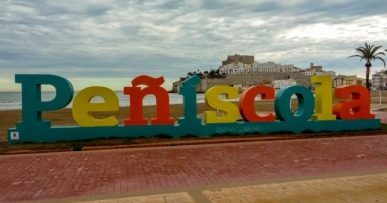 The bike my 2 wheel adventures started on! 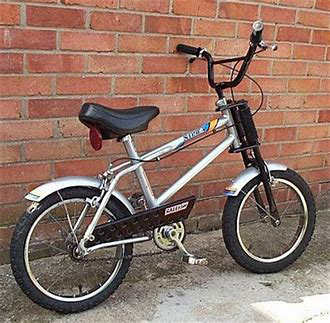 I remember my dad taking the stabilisers off and launching me down a bank in the park assuring me he had hold of the saddle, he hadn’t but I didn’t know until I had got to the bottom screaming all the way, it was different times back then! 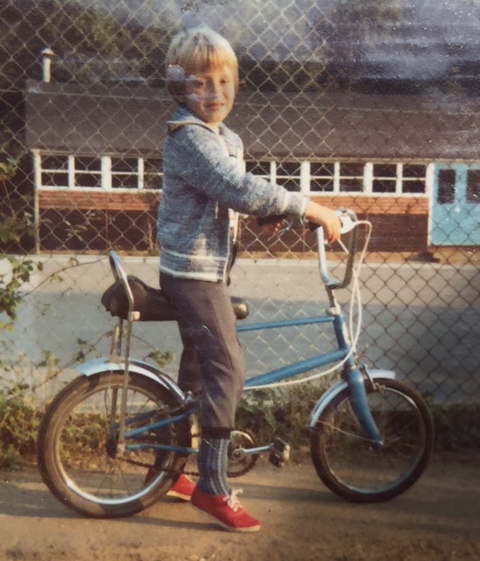 This picture was taken outside my old Primary school, I think the bike was a Raleigh Chipper which was a Chopper for little kids. Note the trousers tucked into socks look, this was essential in the 1970’s to stop your flares getting caught up in the chain. This little beauty was my Raleigh Striker, my choice of wheels during the late 70’s early 80’s at this time my mates had these, Boxers or the Grifter which had gears and was made from iron girders. We used to set up little courses in the woods and pretend we were in junior kickstart or tear around the estate re-enacting the Dukes of Hazzard arguing over who was Bo & Luke, no one ever wanted to be Sherriff Rosco? Cheers Dazzler, I bet I bored you to death for the last 6 months! ?